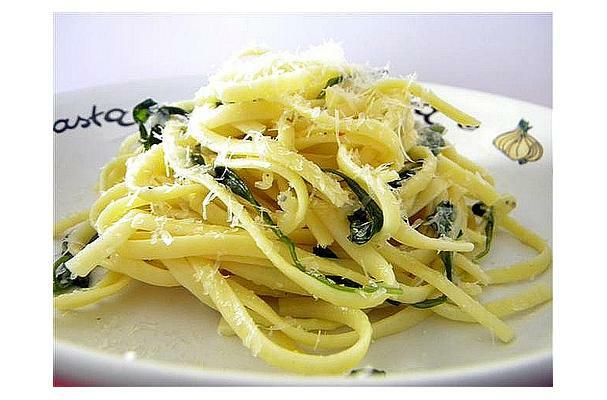 When the pasta is almost cooked saute the garlic in olive oil in a large skillet over low heat until fragrant. Add the arugula and saute until the leaves begin to wilt. Turn off heat. Drain pasta and reserve 1/4 cup of the pasta water. Add the pasta to the skillet along with the cheeses, toss well, add a little bit of the pasta water if needed and a squeeze of lemon/lemon peel if desired. Serve with a drizzle of olive oil and Parmesan cheese.